How can I setup my store to email me new orders? How Do I Set Up an Online Payment Gateway? How do I setup Paypal Website Payments Pro (with Paypal Express)? How can I set up my Tax options? How Do I Specify Where I’m Shipping From for The Real Time Shipping? How can I add a Shipping Method? How can I specify the Countries/States that I ship to? What is FTP and how do I use it? How do I connect to my store using FTP? How do I change my site's Theme? How can I change the colors/styles of my template? How can I customize the various Emails that are sent from my Store? How can I Migrate my Cart from Another Provider? What is the Quick Search? What information does the Customer Stats show me? How Do I Add or Edit My Customers? Can I add a Manual Payment Method just for Phone Orders? What can I do with Incomplete Orders? How can I delete my Not Completed Orders? Ebay Module: Will item inventory update on BOTH systems automatically? How do I import images to the Image Gallery? Ebay Module: Will item price changes update on both systems automatically? How can I send an email newsletter to my customers? How do I set up a Promotion? How does the Mailing List feature work? Why don't the Homepage Carousel images display properly? How do I add additional Administrator users to my Store? How can I Edit the Various Default System Messages? Why is my Statistics Report not working? How do I set up Sales Representative Assignment and Tracking? What are the available 3dcart Plugins? Why Is My BuySafe Button Not Displaying At Checkout? How do I install BuySafe? How do I use the Blog feature? Why won't my Social Commerce Blog display? What pages are included in the XML Sitemap? How do I create my Store's Site Map? Why does my Google Site map XML show the .3dcartstores.com URL? How do I make the DNS changes to my (non-3dcart) registered domain? How do I change my DNS Nameserver with ShopCo? Why do I get Permission Denied when posting to eBay? What is 3dcart's eBay Integration? How do I Get Started with the POS app? How do I Synchronize Products with the POS App? 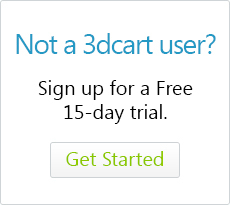 How Do I Get Started With My 3dcart Online Store? How do the Admin Notifications work? How do I use the Global WYSIWYG Toggle? What are my Admin Layout Options? How do I use the Collapsible Menu Bar? How do I change my store's email display names? Why is Google Pay not showing on my site? Does the store keep a log of recent item changes?